4 beautifully renovated 2 br/1 ba apartments with courtyard. Welcome to Pablo Beach Vacation Rentals! Perfect for family reunions, wedding guest accommodations, large get togethers with friends, work retreats. Two duplexes on the same property, for a total of 4 apartments, with individual private yards and a shared courtyard. 8 bedrooms plus 2 bonus private sleeping areas with futons and sleeper sofas easily accommodates 20-25 people. Reserve 1, 2, 3, or all 4 apartments depending on your needs. Rates listed are for all 4 apartments. Email or call for rates for 1-3 apartment rentals. We had a great week end. Everyone enjoyed there places and we all were together. As advertised. Affordable and super close to bea h! If you are looking for the ritz this is not. However it is clean, affordable, and close to the beach. Safe neighborhood. Walk to beach, coffee shops, etc. Erin was very responsive. Great set up for 4 families getting together for the UGA /Florida game! Each apartment was clean, comfortable and well-stocked. The common area outdoors was perfect for everyone to get together. Erin was great to work with. Wonderful experience! One block from the beach. Two blocks from Starbucks. What could be better at this price? Our adult children and their families enjoyed each having their own apartment, yet there was space for everyone to come together for a meal and a nice outdoor gathering area. We appreciated not having to bring beach paraphernalia, sheets and towels. Owners were close by and anxious to correct any issues we raised. We all had a great stay. This house is awesome - perfect for a big group gathering! It's large and spacious so we never felt on top of each other and has a great yard as a central space. 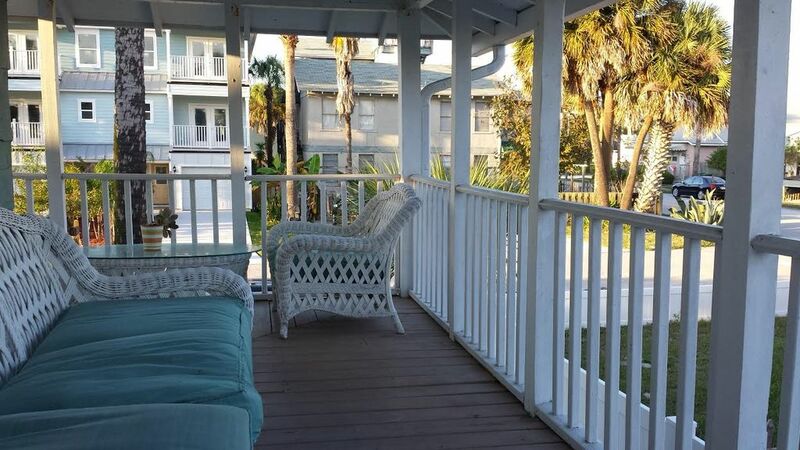 It's also in a great location, less than a block from the beach and a short drive/walk to downtown. We had so much fun and are already looking to book again for next year. The owner, Erin, also made everything incredibly easy and was a pleasure to work with. She always responded quickly and answered questions and the check-in process was seamless. She knew my group was in town to cheer for the Gators in the Florida/Georgia football game and hung a huge Gator flag outside before we arrived! It was such a great personal touch and we immediately felt at home! Rates and fees are for renting entire property. Please call for rates for renting 1-3 apartments. Pet fee is per pet.